Alastor WILL EDIT COLORS LATER. 'Lastor was born in the heart of winter, along with two other pups. Alastor is larger than the average male, mainly because he has long powerful legs. His frame is only slightly broader than the common adult male. Al's build was designed for brute power, with a large muzzle full of long sharp ivories, to his wide paws to support his structure. Along with his broad paws, he has long and sturdy talons for traction, making him sure footed and able to be agile with a long frame. Alastor has ears a tad larger than the average size, sharply pointed more than rounded. This masculine towers over petite females, and has a few inches over each male..
His coat like most wolves, has two layers. An under layer built for various weather- trapping heat in winter and cool air in summer. Keeping him content in most situation. It's plus and soft. While his outer layer is more sleek and thinner. Though, his pelt is not the most water resistant. Yet Alastor loves that, storms are one of his favorite things and he enjoys feeling the droplets seep through. Alastor's eye color is a bright, intense silvery-blue. Though seeming to be an icy color, his gaze actually holds a subtle warm look. Small flecks of silver can be found scattered through out his eyes. In the light of day, Lastor's eyes look like a pale sky blue, or clear water. Though in the luminous glow of the moon, they appear more silver. The only visible scar or odd marking on Lastor would be the two scars over his right eye. Around five years ago, a new couple had taken the leading role in their pack of 15. A large brown and white male named Kalos, and a black and grey female named Vigilance. The couple were well rulers, kind and caring. Leading their family with wisdom and grace, they had few liters, though each brood grew to be powerful and well defined wolves. two years later, a new liter was birthed, Three small and healthy yelping young ones were brought into the world on a frightfully freezing night. 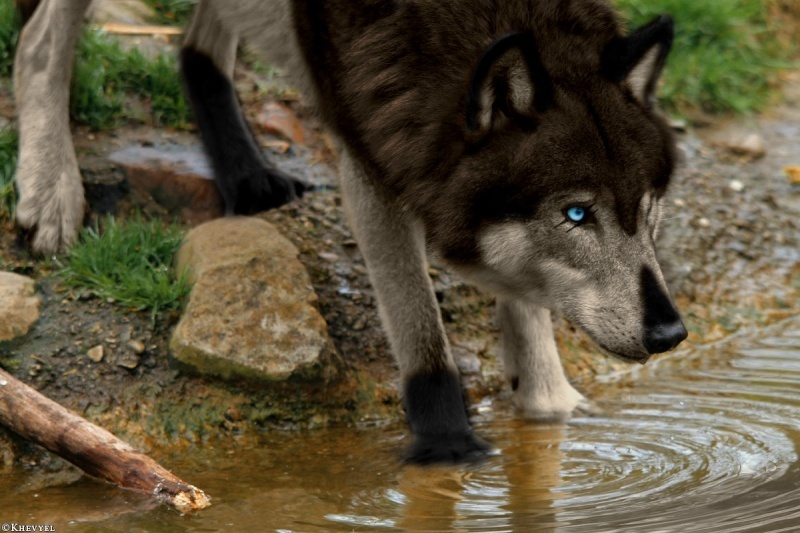 A solid black she-wolf with glowing green eyes, Kalos named her Echo, a large male painted with brown and faded shades- Vigilance naming him alastor, and finally another young female, she was light golden tan, kissed by the sun itself. Kalos named her Soleil. The small family of five was already very closely knit. Throughout the night, the family stuck close for maximum warmth. Over the next couple months, much changed for they three young pups. They learned to walk and travel small distances, their hearing and sight finally kicked in, and a healthy appetite as well. They were three months old when it started, Alastor and his siblings were playing by the den entrance with their mother happily sunbathing when suddenly frantic terror and panic rose on the scene. It was unforgettable, Last's ears swiveled as the familiar tone of his father's thunderous howl echoed from the hunting ground to the den. Vigilance was in a frenzy, snatching up Soleil and Echo, rushing them inside. Lastor, however, had found a small rock to perch himself on. His small den home was atop a large hill in the center of his land, making his tiny rock enough to see what was happening. Small icy blue eyes widened at the sight of scrambling pack mates, the large warriors were nuzzling their families and bounding off to the territory boundaries. And Kalos was no where in sight. Confusion filled him, though soon his mother grabbed him and placed him inside as well. "What's going on mommy?" He questioned Vigilance as he watched her paced back and forth. "My dears, another pack close to our was pushed from their land, and now they want ours. And will do anything to take it from us." Alastor and his siblings whined lowly, still confused on why someone would do such a thing. For the next 9 months, food was scarce, and the war raged on. The small trio was now one year of age, the new age to fully participate in full pack life due to the war. Alastor was nearly the size of a fully grown wolf, and was slowly taking on the role of beta, since the former one had lost his life in the war. Echo was taught to heal, helping those who survive the battles, and Soleil a huntress, trying her best to feed the slowly deteriorating pack. Lastor, like all males, was taught to fight and fend for himself in he needed to be sent out into the war. But for now, he held down the fort and took care of his pack mates. Being the authority figure at home, making sure each family had enough food and care,the beta title slowly taking him. Though soon the day came, his mother's biggest fear. Kalos returned to the den, and spoke to his mate, Lastor could hear her yelling and sobbing. And soon Kalos yelling back "This is what he was trained for! Our pack and land will soon be gone, he must go, he has to!" He knew what that meant, it was time for him to join the battles erupting on the front line. and his alpha returned home, limping, bloody, though happy. Vigilance graciously greeting them and never leaving their side for another month. When Alastor was one year and four months, they had a strange visitor. 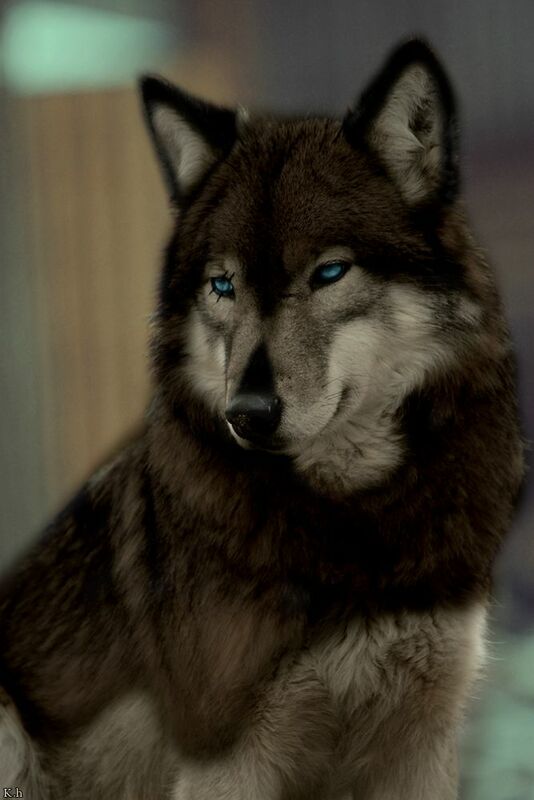 An alpha of a near pack, he was older, possibly 8 or 9 years of age. His name was Denali, and he wished to converse with Kalos and Vigilance in private. Alastor couldn't help but notice the way the elder looked at him, almost in awe and much interest. Al just stared back, and soon left to mingle with his pack. Inside the den, the leaders talked, Denali wished to arrange a mating ceremony with a powerful warrior and his beloved only daughter. He was soon to retired and his mate was already deceased, he seemed highly interested in the thought of Alastor being his new son. While the leaders spoke, it was soon time for Denali to take his leave, and Lastor's parents wished to speak with him. "Denali has offered an alliance with our family, and also use of their generous hunting grounds." Kalos spoke to him, a small smile there on his face. "That's great." Lastor happily replied with a slow wagging tail, though his mother did not seem so happy about the words, which worried him "Why has he shown interest in us? We are still recovering from war, there is nothing we have to interest him, what was the deal father, tell me." His face and voice were stern and needed to know what the elder wanted. Soon his mother's voice chimed in. "He is interested in something we have, he is interested in you. He has a young daughter your age, he wishes to join you two and allow you to lead his pack. He needs a heir." He gulped, he was not even two yet, love and mating was something he had not yet thought about, though he agreed. Stating it was best for his family, and he may find love with this new wolf. The next day, he was arranged to meet his new future mate, she was slim and breath taking to look at. Mixtures of honey, brown, and white painted her, with a sweet voice to match. "Hello sir, my name is Oaklee. You are Alastor, I assume?" Her high voice was followed by a small giggle and shy smile. Alastor happily allowed his tail to wag and began a small conversation. The two young wolves spent the day together, and accidentally the night together too. When the sun fell and the moon rose, the two young canines fell asleep under a tree and did not wake until morning. Their new relationship seemed be be working very well, and it did for two months..
Oaklee and Alastor were around the age of one and a half, and things couldn't have been going better. Alastor's birth pack was once again on their feet - two months of rehabilitation and they were on top. Oak and Lastor were being claimed the new leaders of Denali's pack. Finally, his life was where he wished it to be. It was just a few weeks later when Oaklee announced her pregnancy. They were young, though on top of their game. Nearly a month before the due date, chaos struck and their perfect life began to crumble. Alastor's family was under attack once more. A new pack coming in to take over. Lastor would not stand for such disgrace, he was going to use his pack to aid his family. Though Denali forbid it. "That is not our fight, Alastor. That is no longer your family. This is. You take care of us, not them." Denali was strict with his words, though Alastor didn't care about them. "That's my family. They will mean more to me than you ever will. You don't know what family is Denali." Alastor growled his words and fled to assist his birth pack in war. As he ran off, Denali growled back "If you leave, you are never allowed back! Do you hear me? This is no longer your pack! You are no longer its leader!" Al didn't care. He ran as quickly as he could to his family. When he arrived, it was too late. His father had been ambushed and killed. Alastor took hold of his father's position, and led his family to battle. 3 more months of his life spent on war. Blood spilled and violence never stopped for a moment. Ultimately, Alastor's family came out victorious. During the time, Oaklee fled from her family and took refuge with Al's mother and sisters, which soon after was the birthplace of Alastor's first pups. Kaska - a female with Al's markings though Oaklee's shades. And a male, Arkose, with same coloring as his father. The battles ended, Kaska and Arkose were 2 months old. Oaklee and Al only 1 and 10 months. It was time for a new beginning. A fresh start. But before that was able to happen, once more, things had to take a turn for the worse. Oaklee's father was enraged that his sole heir fled the pack. Enough to the point where he declared if he can't have Oaklee, then no one can. Denali attacked Oaklee when spotting her on patrol one evening. The blood curdling shriek of his mate sent Alastor charging forth. He bolted down a hill into the field where she lie, with Denali aggressively over her. Lastor quickened his pace and attacked, it was a battle between an experienced male and an aggressive young warrior. Denali gave Alastor the scars over his right eye - and Alastor, he gave Denali a taste of his anger and ended his life. Alastor and his two young pups were now alone. Echo and Soleil agreed to travel with Al and his pups.8 months of travels brought them to a small peaceful pack. The adult trio 2 and a half, Kaska and Arkose now 10 months. They decided to stay, though Alastor just couldn't settle. He said goodbye to his sisters and his beloved pups, and set forth on his journey. Alastor grew slightly bitter towards many. The sight of Oaklees body always seems fresh in his mind. Getting attached isn't on his list anymore. He was alone for a year before entering another pack land. Protective >> Alastor thrives on protection, his pack is his life. He dedicates himself to being a protector in his new pack and will never hesitate to risk his life to keep his loved ones safe. You will seldom find another who is as dedicated when it comes to the protection of one's pack. Determined >> Alastor is strong willed and has a good head on his shoulders - when he has his eye on something he's surely determined to gain it. He's often seen as a natural leader and hates to fail, making determination a strong aspect in his life and natural personality. Hot-Headed >> Al is known for having a short fuse in his recent years, if you press his buttons - he will get riled up and grow defensive. His tolerance for rule breakers, slackers, and disrespectful wolves are low. Especially if he seems is as a threat or insult to his family. After the incident with Oaklee's father - it doesn't take much to make Alastor aggressive. If a challenge is offered to him during this stage, it'd be rather bloody and brutal. Loyal >> Lastor can be a pain, but once he swears loyalty to you, you'll never lose him. He could never be a traitor or disobey his higher ranked. Though, he expects the same in return. Assertive >> Alastor is a strong believer in high and low ranks - though he gives each a credited amount of respect - he will not hesitate to show he is higher than someone lower to him. His word was once law in his past, and will no refrain from making himself heard and understood.